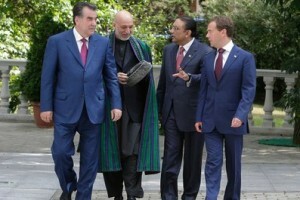 The August 18-19 Sochi summit attended by the leaders of Russia, Pakistan, Afghanistan, and Tajikistan – the second fourlateral one after the July, 2009, Dushanbe meeting – showed that the format indeed helps to address the geopolitical problems of Central Asia and to strengthen peace and security in the region. The Sochi agenda was topped by the struggle against drug trafficking and terrorism and by the economic cooperation between the region’s countries. The tragic situation in Pakistan, the country where an unprecedented flood has caused a national disaster, drew special attention at the summit. The leaders of the four countries also discussed joint antinarcotics efforts and the prospects for stabilizing Afghanistan – particularly its border zone adjacent to Pakistan – and Pakistan’s tribal zone in the Khyber Pakhtunkhwa province (previously known as the North-West Frontier Province). Russian President Dmitry Medvedev and his Pakistani counterpart Asif Ali Zardari confirmed at a bilateral meeting during the summit that the two countries are interested in broader cooperation in economy and international politics. At the opening of the meeting, the Presidents offered each other condolences as Russia had recently faced an unusually intense drought and forest fires and Pakistan had suffered the devastating flood. Due to the critical situation in Pakistan, President Zardari had to leave the summit in several hours instead of staying for two days as previously planned. Stressing that Russia is seeking closer economic partnership with Pakistan, President Medvedev expressed regrets that little had been accomplished up to date and the hope that the cooperation will grow more dynamism in the nearest future. Pakistan hit by the flood is watched with compassion across the world. Socioeconomic consequences of the disaster will spread beyond the Pakistani borders and affect the entire Central Asia. According to current estimates, some 20,000,000 people have suffered from the catastrophe which left almost 1,700 dead and 2,090 injured and hospitalized. The flood in Pakistan destroyed 576,000 residences and the country was forced to set up 1,520 provisional camps, but large numbers of people still remain unsheltered and have to survive on small pieces of land not absorbed by water. At the moment Pakistan is facing the threats of famine and epidemics. UN Secretary General Ban Ki-moon described the situation in the country as terrible and heart-wrenching. He said he had never seen a natural disaster of such proportions and called for faster international relief. Even though the majority of countries and international organizations have already responded to Pakistan’s call for help, at the moment the international relief could still be more extensive. The Asian Development Bank is expected to extend a $2 bn emergency loan to Pakistan, the World Bank has already given the country $900m, and the UN intends to provide $460m, of which $272m have already been delivered. The Saudi Arabia and the Organization of the Islamic Conference have pledged $70m and $11m respectively (the latter is allocating funds via the Islamic Development Bank). Russia has also taken an active role in the relief campaign – several IL-76 aircrafts of the Russian Ministry for Emergency Situations with humanitarian aid have already landed in Pakistan. As for the current state of the economic relations between Russia and Pakistan, it is true that it leaves much to be desired, and the country’s presidents had to admit in Sochi that no progress is being made. The trade turnover between Russia and Pakistan barely passed the $400m mark (in stark contrast, Pakistan’s trade turnover with India – the country Islamabad clearly can’t count among its friends – has broken the $2 bn ceiling and continues to post steady growth). It is a serious result of the Sochi summit that – as the Russian and Pakistan leaders have decided – the inter-government commission on bilateral cooperation established several years ago will finally hold its first working conference in September after the protracted period of inaction. President Medvedev expressed Russia’s interest in joining the $7.6 bn Iran-Pakistan-India gas pipeline construction project (the pipeline will stretch over 1,000 km) and in helping Pakistan upgrade the Karachi metallurgic plan built in 1985 with the Soviet assistance (the capacity of the plant currently outputting 1.1m tons of steel annually should reach 1.5m tons and 3m tons after the first and second phases of the upgrade). Russia and Pakistan will also look into the existing opportunities for cooperation in the rail transit and energy sectors. The Russian President suggested that greater numbers of Pakistani students seek admission to Russian universities. As a significant initiative, Russian banks will likely open divisions in Pakistan to service export and import operations. Russia’s foreign minister S. Lavrov told the media that economic cooperation should be the engine of the relations between Russia and Pakistan. 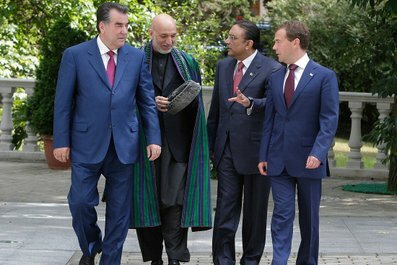 President Zardari invited Russia to invest in the Pakistani energy sector, mountain industry, and manufacturing infrastructures. It was agreed that President Medvedev would visit Pakistan, and President Zardari stressed that as a superpower Russia is playing an important role in maintaining stability in South and Central Asia. This is not the first time a Russian leader is invited to Pakistan – so far the tours by lower-ranking Russian officials have produced minimal results. What could be the explanation behind the stagnation? I spent years searching for the answer as a scholar professionally interested in Pakistan. Can’t Russia joint as an observer the international organizations where Pakistan is present? In the past, Russia supported Pakistan’s successful bid to join the Shanghai Cooperation Organization as an observer. Pakistan assisted Russia in entering Organization of the Islamic Conference where Russia currently has the observer status. From the standpoint of the development of the relations between Russia and Pakistan, it would be beneficial for Moscow to get incorporated into such groups as SAARC (South Asian Association of Regional Cooperation) and Friends of Democratic Pakistan (its current membership includes Australia, Great Britain, Italy, Canada, China, the United Arab Emirates, the Saudi Arabia, the US, Turkey, France, Japan, and representatives of the UN and the EU). At present Pakistan is led by a new civilian President and a new government, reaffirms its commitment to building up the economic and political relations with Russia, and even to opening negotiations with Moscow over arms trade. Somehow, Moscow seems to avoid practical steps and routinely limits its involvement to fairly unproductive discussions. It should be realized that concerns over the potential discontent in Delhi which no doubt would react negatively to Russia’s rapprochement with Pakistan reflect an obsolete political vision. For ages India has not been regarding Russia as the number one partner in many spheres, its 2010 nuclear energy deal with the US and Canada and massive acquisitions of the Israeli military electronics exemplifying the trend. For Russia, ignoring Pakistan – the country with the population of 175,000,000 located in a strategic region and neighboring Afghanistan, India, and China – is an ill-conceived strategy. Moreover, Delhi’s willingness to normalize the relations with Islamabad which was demonstrated clearly during the talks between the Indian and Pakistani foreign ministers on July, 15 should also be taken into account. Today, ample opportunities are available to promote the economic – and even political – relations between Russia and Pakistan. Sergei Kamenev is the chief of the Pakistan sector of the Institute of Oriental Studies of the Russian Academy of Science.